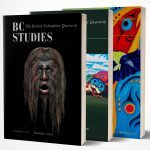 Sometime between 1720 and 1850, late in summer, an eighteen-year-old man was traveling in an icefield in the present-day territory of the Champagne and Aishihik First Nations, in what is now Northwestern British Columbia. Well provisioned and warmly clothed but moving through a challenging environment, he sadly lost his life; however, this young man’s story did not end with his death. In 1999 a group of teachers hunting for Dall’s sheep in Tatshenshini-Alsek park encountered the man who would come to be known as Kwäday Dän Ts’ìnchi (Southern Tutchone meaning ‘Long Ago Person Found’) emerging from a melting glacier. This extraordinary meeting resulted in a collaborative effort involving Champagne and Aishihik First Nations, the BC Archaeology Branch, the Royal BC Museum, the Yukon Heritage Branch, as well as numerous other organizations and individuals, to learn more of Kwäday Dän Ts’ìnchi’s story. This exceptional and weighty book (688 pages), represents the culmination of nearly 20 years of work. A substantial editorial effort, coalescing previously disparately published material, this volume contains diverse contributions from 69 authors: 3 forewards, 37 chapters, 6 section introductions, 1 poem, a conclusion, 3 appendices, and a section of colour photographs. Chapters generally read in an academic style. However, breadth of content and remarkable subject matter should extend appeal outside of academic circles. Chapters are organized into six sections: “Respecting the Discovery” outlines the first encounter with Kwäday Dän Ts’ìnchi, the natural setting of the region, and all following fieldwork at the site, as well as radiocarbon dating results. “People, History and Honouring” situates Kwäday Dän Ts’ìnchi in the contemporary cultural landscape, providing perspectives from within the Champagne and Aishihik community and outlining consultation with other groups, cultural protocols followed, ceremonies undertaken, and the rich history of the Tatshenshini-Alsek region. “Lessons from a Short Life” presents incredibly fine-grained and careful analysis of Kwäday Dän Ts’ìnchi; microscopic, DNA, and chemical investigations reveal subtle details of his life, health, travel routes, and recent meals. “The Belongings and the Artifacts” summarizes analysis of the items found with Kwäday Dän Ts’ìnchi, as well as those left behind in the area by others over hundreds of years. Detailed study of these unusually well-preserved belongings offers a rare opportunity for learning about life in the past. “Journeys” combines different ways of knowing to further understand Kwäday Dän Ts’ìnchi’s movement through past landscapes. Traditional stories of glacier travel, contemporary accounts of life in a glacial landscape, scanning electron microscopy, and experience gained through retracing his route by foot, are successfully combined to better comprehend his journey. The final section “Connections”, presents a ground-breaking community coordinated DNA study which traced Kwäday Dän Ts’ìnchi’s mtDNA to seventeen living relatives all belonging to the contemporary Wolf/Eagle clan/moiety, allowing his fundamental cultural identity to be known. The theme of connection is continued in a commendably transparent review of the collaborative process as well as with projects connecting contemporary people with traditional practices. Closing words reflect on Kwäday Dän Ts’ìnchi’s power to bring people together to share in learning. This volume contributes a unique and important perspective to the deep history present in the region and to human history more broadly. It will stand out as an important point of reference in the future. Its humanist, collaborative, and respectful ethos contrasts with the coldly clinical treatment of Oid-p’ma Natitayt/Kennewick Man, Ötzi, and other ancestors (Bardill et al. 2018; Sharp 2002; Thomas 2001). In the last chapter former Champagne and Aishihik chief Diane Strand (Xixch’tláa) emphasizes the opportunity for kets’ädän (learning) and the importance of passing on what one has learned. I encourage everyone to read this volume, to learn, and to pass on some of the teachings from Kwäday Dän Ts’ìnchi. Victoria: Royal BC Museum, 2017. 668 pp. $49.95 paper. Bardill, Jessica, Alyssa C. Bader, Nanibaa’ A. Garrison, Deborah A. Bolnick, Jennifer A. Raff, Alexa Walker, Ripan S. Malhi, and the SIGN Consortium: Matthew Z. Anderson, Rene L. Begay, Jada L. Brooks, Katrina G. Claw, Anna M. Cordova, Keolu Fox, Nathan Nakatsuka, Angela J. Neller, Jamie M. Singson, Kim TallBear, Krystal S. Tsosie, Tada Vargas, and Joseph MV Yracheta. 2018. “Advancing the Ethics of Paleogenomics.” Science 360 (6387): 384. Sharp, David. 2002. “Time to Leave Ötzi Alone?” The Lancet 360 (9345): 1530. Thomas, David H. 2001. Skull wars: Kennewick Man, Archaeology, and the Battle for Native American Identity. New York: Basic Books.